The Center for Immigration Studies has issued a report, Fewer Jobs, More Immigrants, maintaining that despite the loss of 1 million jobs, 13.1 Million immigrants arrived in the last decade. The level of immigration remained the same despite a huge worsening of job creation. Most tellingly, in 2008-2009, in the midst of the greatest economic downturn since the Great Depression, 2.4 million new immigrants (legal and illegal) settled in the United States, even though 8.2 million jobs were lost over the same period. And the forecast is miserable, the LA Times print edition headline screaming “Fed forecasts hears of pain on job front.” The article did not quote anyone who thought that cutting back immigration would be a good idea. 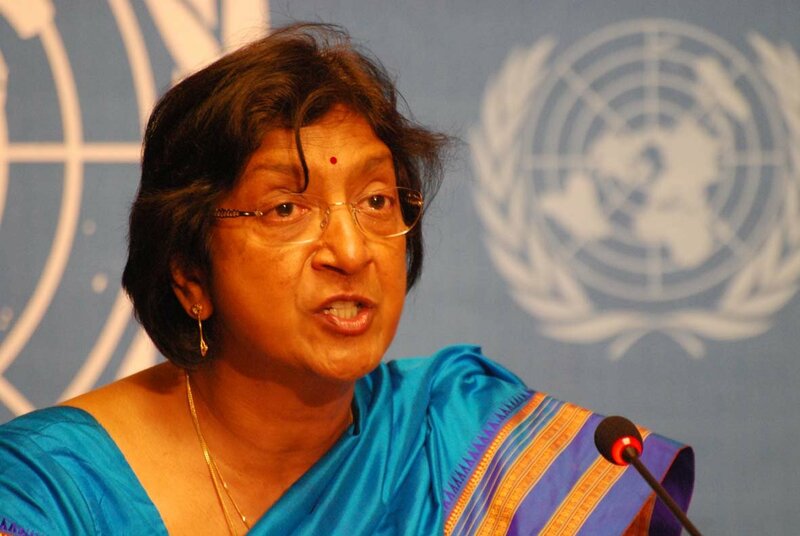 Navi Pillay, the UN High Commissioner for Human Rights, stated that “Although states have legitimate interests in securing their borders and exercising immigration controls, such concerns do not trump the obligations of the state to respect the internationally guaranteed rights of all persons.” Among those rights is the right to migrate wherever they want–effectively saying that in fact states have no right to control their borders. She implies that the developed world should be willing to take in 214 million (!!) international migrants. America is clearly not doing its share. (And there will be plenty more prospective migrants as soon as these 214 million are settled in.) Indeed, as A3P notes, she essentially threatened Americans as being outside compliance with international law, stating that “The principle of non-discrimination is fundamental in international human rights law.” Everyone has a right to come to the US and the US has no right to discriminate among among prospective immigrants. In the hands of Third World ideologues, what started out as the powerful, uniquely Western idea that people have rights against the state is in effect turned into the right to displace the people who created these societies. Western societies have rejected an identity based on their traditional people and culture in favor of an ideology that they are nothing more than “proposition nations”–a major theme of The Culture of Critique. Such proposition nations are ill-equipped to establish a principled intellectual defense against such egregious expansions of rights. Viewed from the perspective of, say, an African native of Kenya, any policy that discriminates in favor of people of European descent involves impermissible discrimination. Clearly, there will be unrelenting pressure on the West to admit ever more immigrants–regardless of the economic conditions in those countries and regardless of the consequences to the founding populations and their culture. The Camp of the Saints nightmare in slow motion. But since the elites of all Western societies are resolutely committed to the dispossession of the people who built them, one never hears anything from political leadership or from the mainstream media about the astounding fact that legal immigration has continued more or less as it has been despite millions of unemployed Americans.